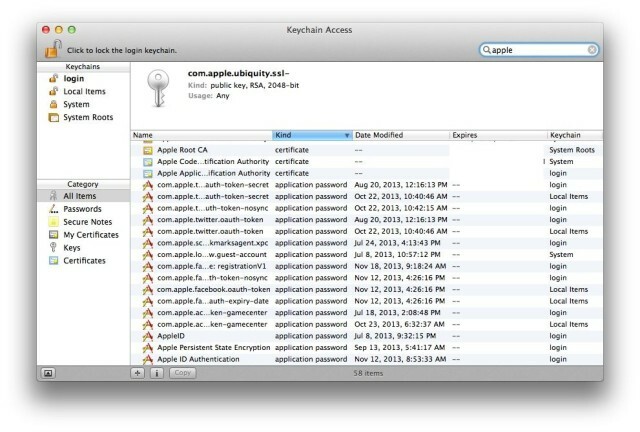 If you store your user name and password details via the Keychain in OS X, you know that Keychain makes it a lot easier to do so. You can store login details for all those websites you visit, including banking info, social network details, and the like, right in the Keychain. At some point, though, you might forget the actual passwords. It’s like how we used to know all our close friends’ phone numbers by heart, but with the advent of the smartphone, I doubt many of us even know too many of our buddies’ actual digits. If you want to remember the passwords that are stored in Keychain, though, you’re in luck. First off, launch the Keychain Access app. It’s easily found in the Utilities folder in the Applications folder, but you can launch it with any launcher app like Alfred; it’s a regular app. Once you’ve got it launched, type the name of the website (or an app with login details you use) into the search field there in the top right corner. You’ll see a list of matching terms, but if you sort by Kind by clicking on that column there at the top, you can scroll to the results that say “application password” or “website password” to find the specific site or app you’re looking for. You can also click on the Passwords category to the left to filter just for passwords, as well. Double click on the entry for the site or app you want to see the password for, and click on the “Show Password” checkbox. You’ll need to type in your admin login and password here, though, so hopefully that’s not the one you’ve forgotten. Once you do so, though, you Mac will show you the password for that website, so you can remember it, perhaps when you’re logging in from a computer that’s not your own. Just remember to log out (not that it’s happened to us, of course – grin).